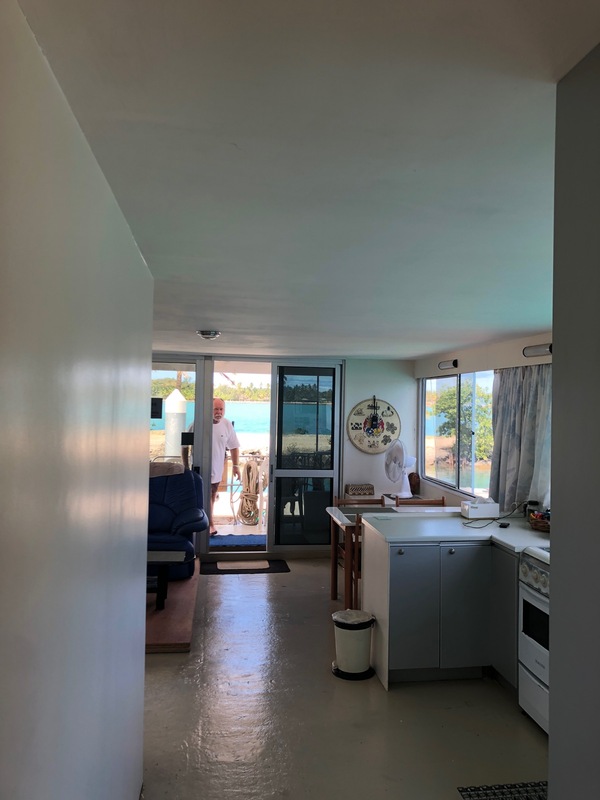 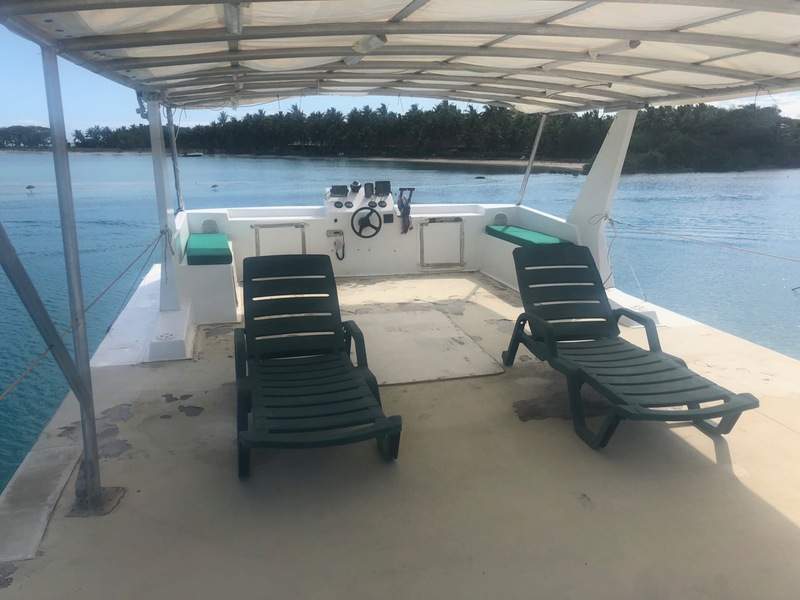 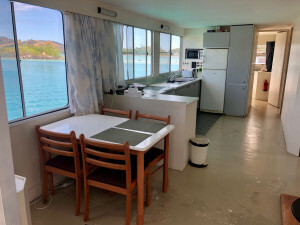 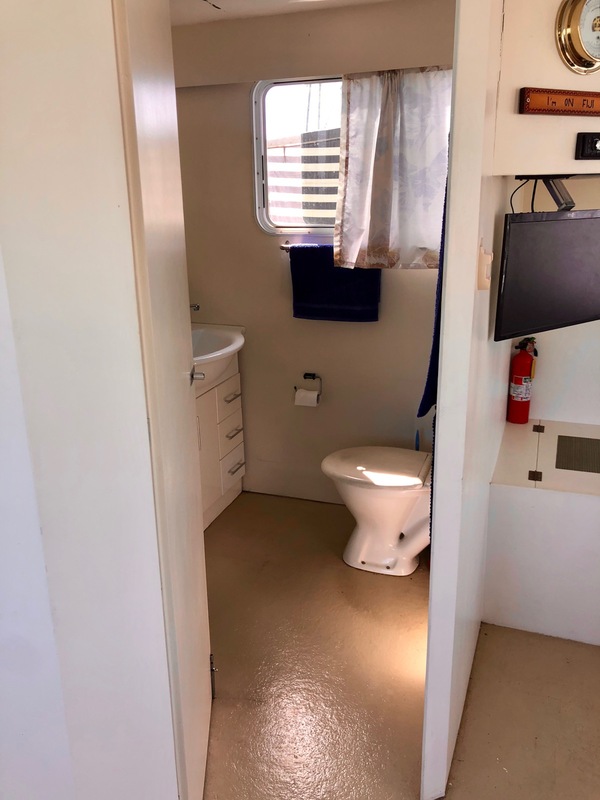 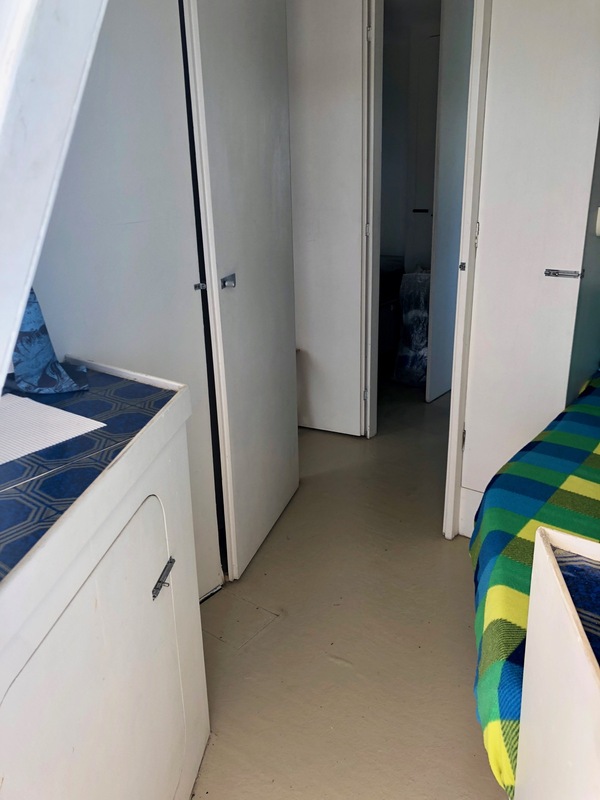 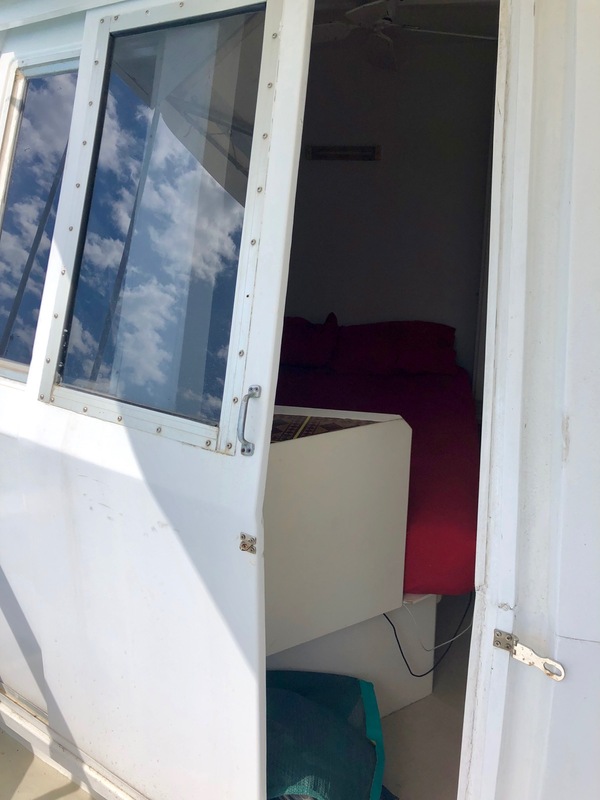 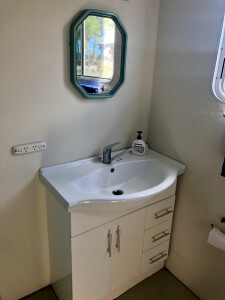 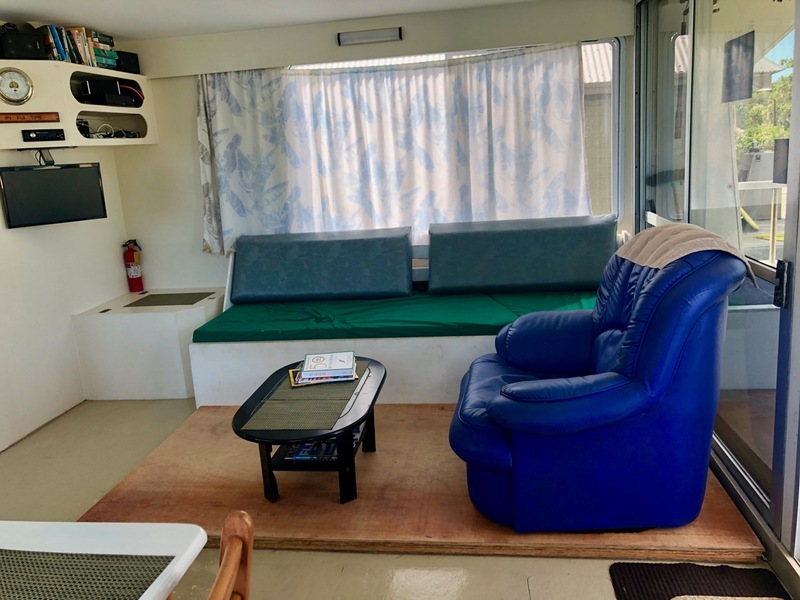 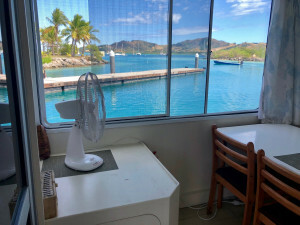 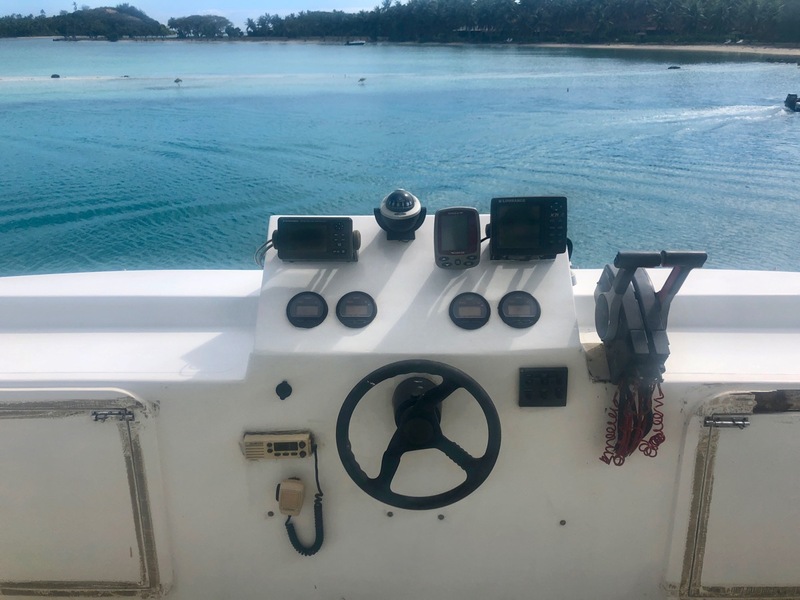 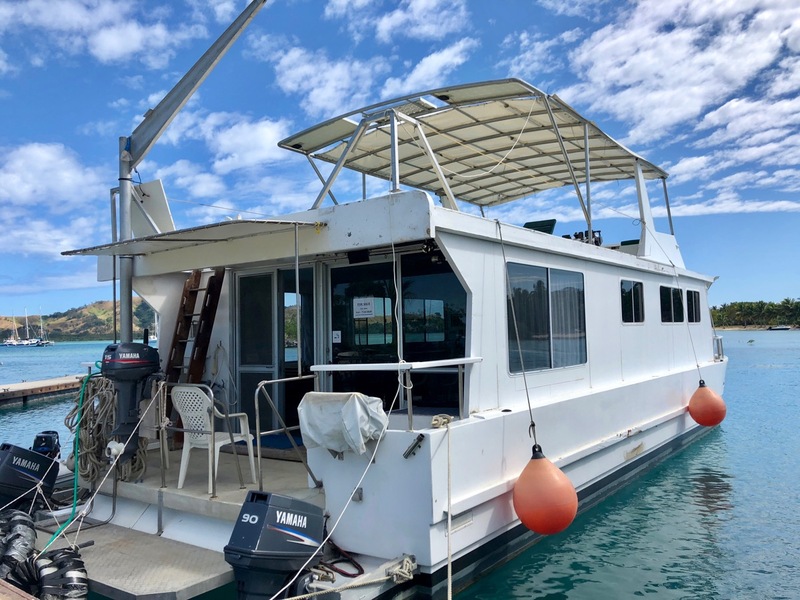 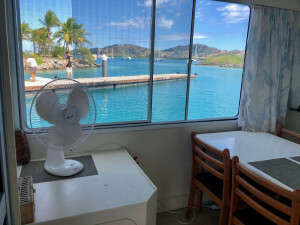 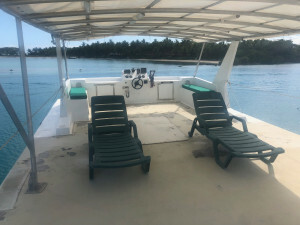 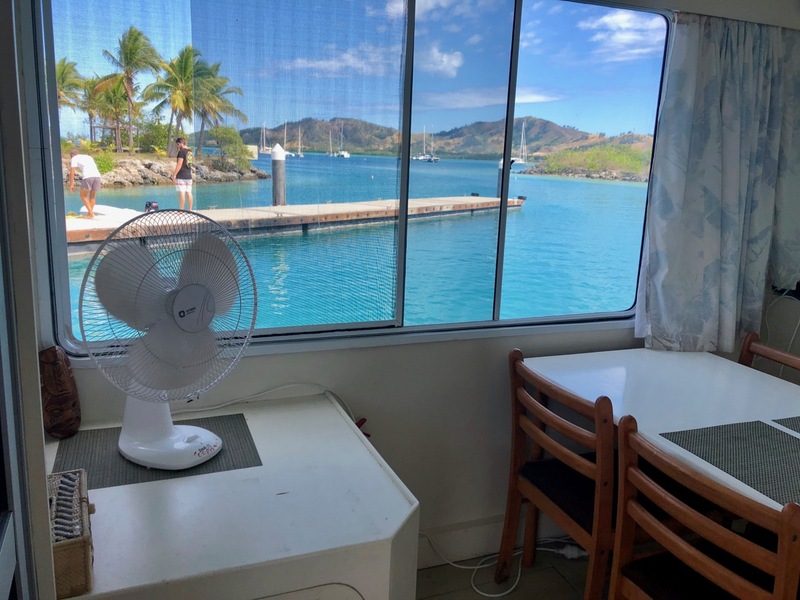 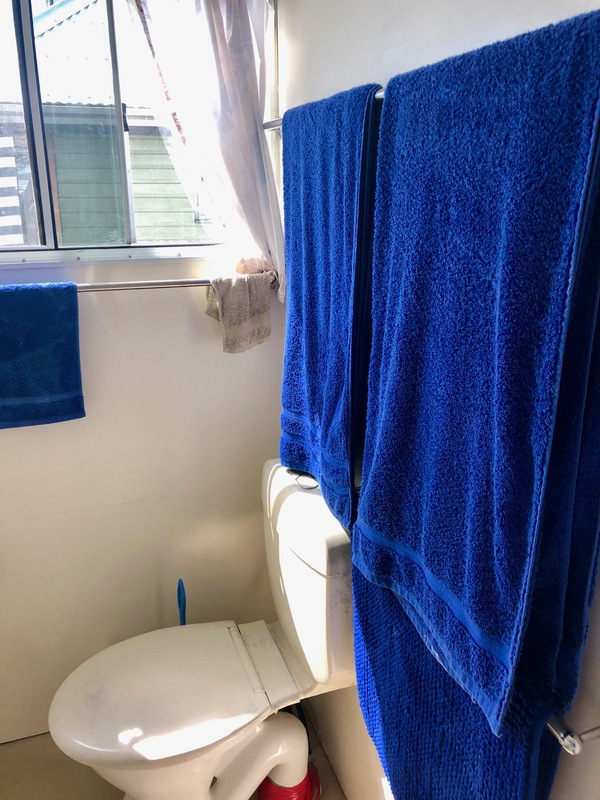 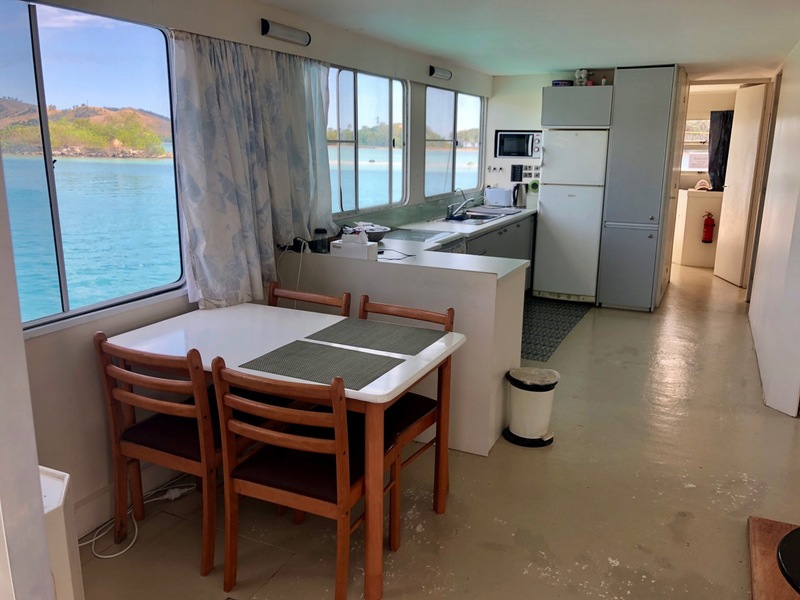 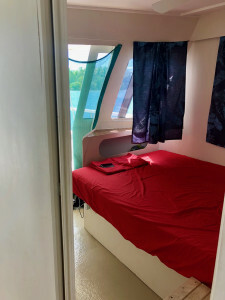 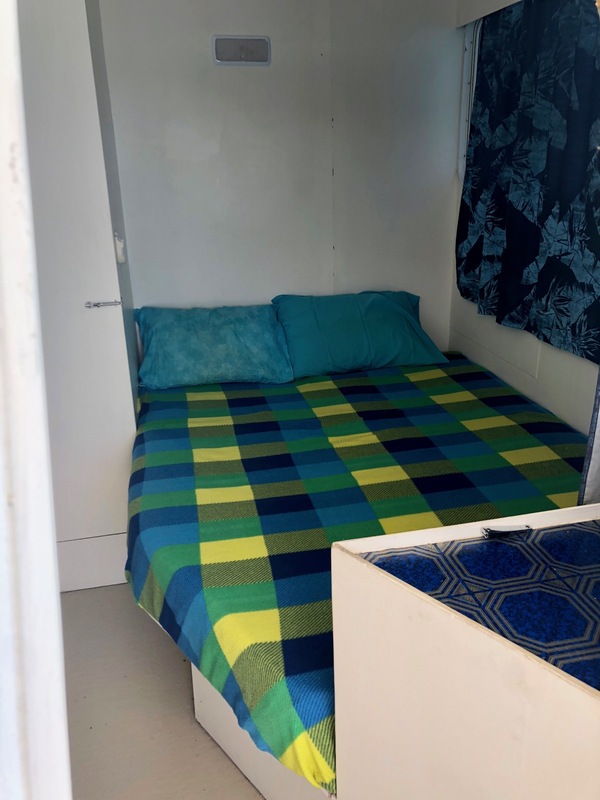 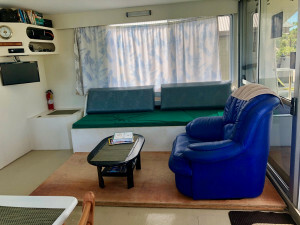 The only available houseboat for sale in Fiji, this vessel represents a rare opportunity to secure a solid and very lucrative investment in one of the most sought-after tourist destination in the world. 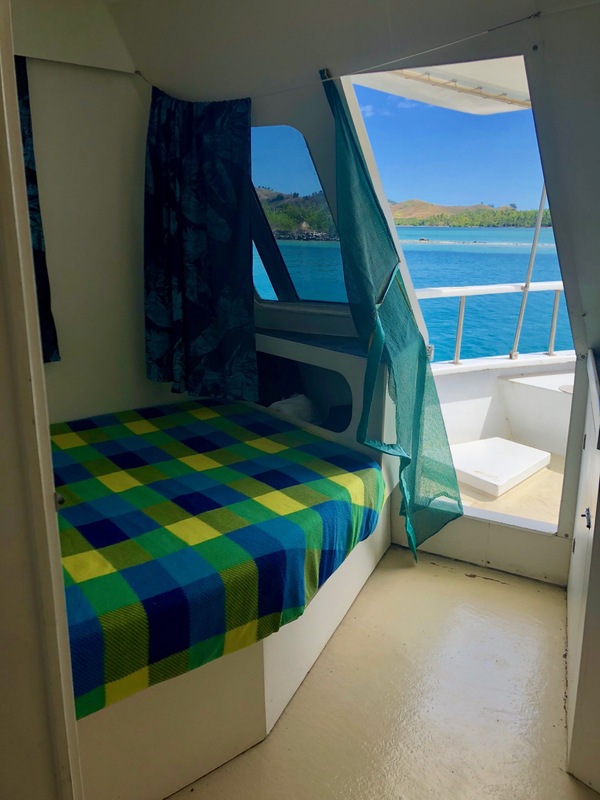 Refitted in 2010, the vessel is ready to use, but could be refitted for private or commercial luxury accommodation, which is in high demand in Fiji. 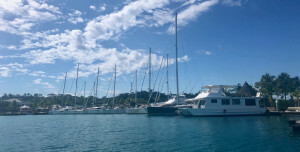 In fact, the charter demand in Fiji is at an all-time high and keeps growing each year. 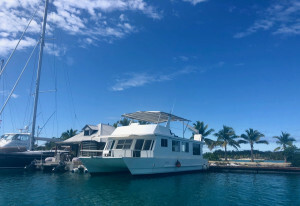 To add extra incentive to non-resident and residents alike charter vessel owners, the government recently dropped the charter income tax dramatically from 24% to only 9%. Equipped with two powerful outboard engines, this vessel regularly cruises from her permanent (cyclone proof) storage berth at Viti Levu (the delightful Vuda Marina) to Musket Cove at Malolo Lailai with her pristine blue lagoons, easy access to the world-famous surf spots such as Cloud Break, Namotu and Tavarua, but can also explore further afield and be anchored in a more secluded spot. 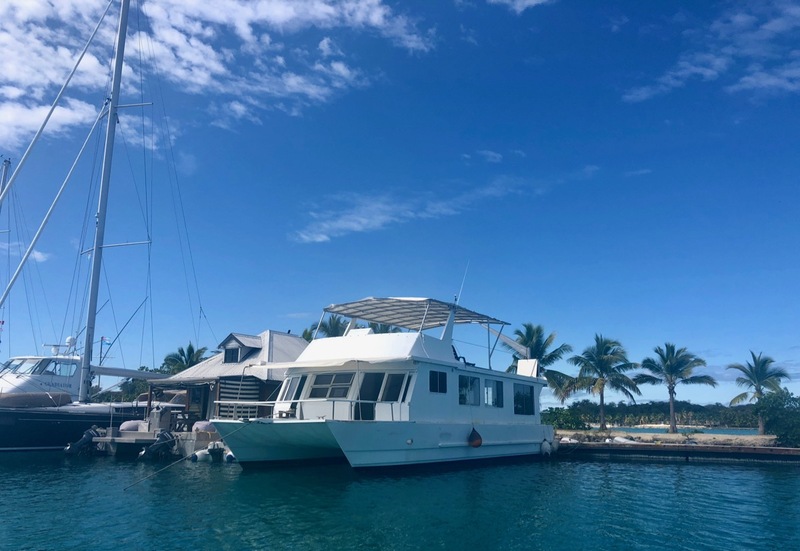 With over 300 islands to chose from, there are plenty of idyllic lagoons and anchorages to choose from. 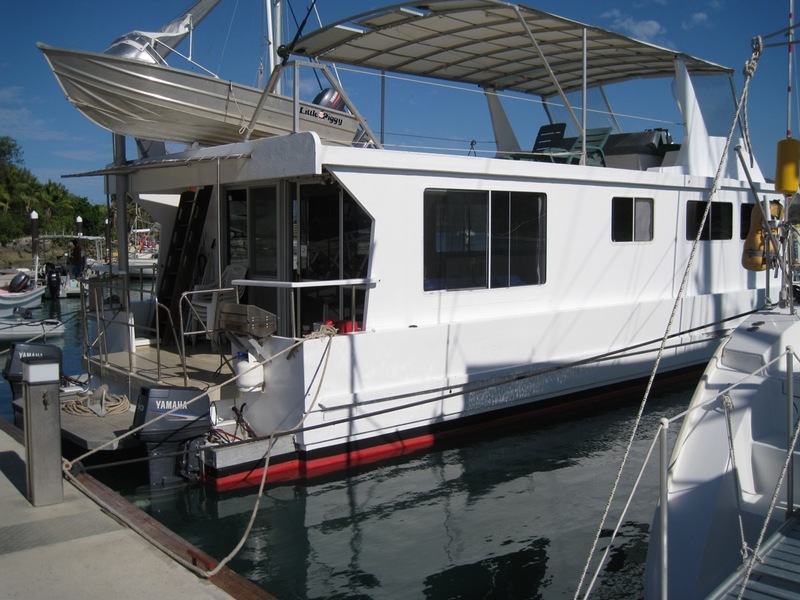 The vessel can remain for long periods of time away from marinas thanks to her solar power supply and 2000L of water! 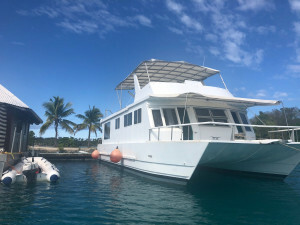 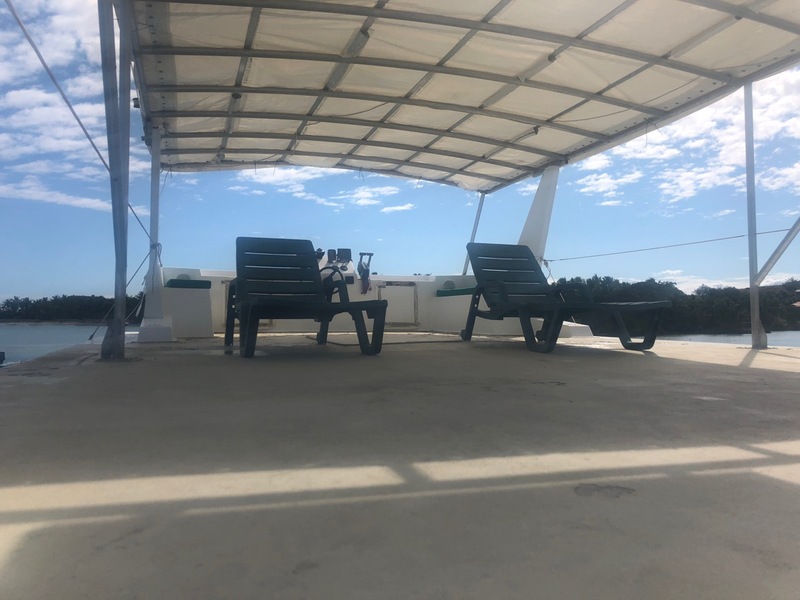 With its huge sheltered flybridge for entertaining or relaxing, aft and forward cockpits, easy to board transom, and equipped with a strong lifting arm for its 12' aluminium dinghy, this massive power catamaran (houseboat type) offers unlimited potential. Inside, the boat is designed around a large lounge and dining room, open plan kitchen and three double bedrooms, two of which open directly over the forward cockpit. 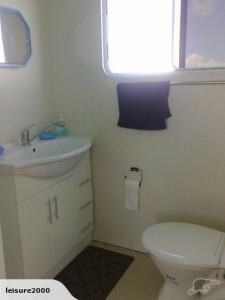 For more information please contact Anna on +61 420 882 296 or visit our website. 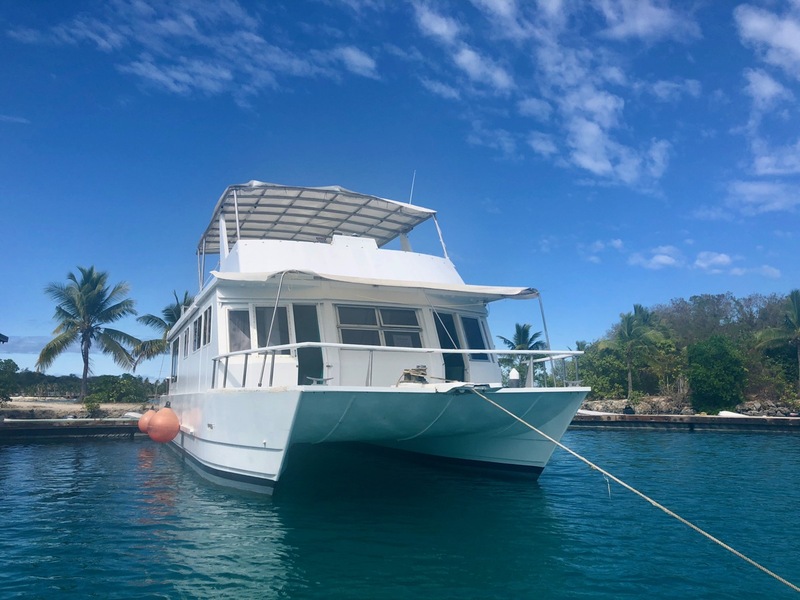 'Wai Tui' was photographed at Musket Cove (September 14th 2018) but will be moved to permanent berth at Vuda Marina by the end of September for easy access from international airport.. 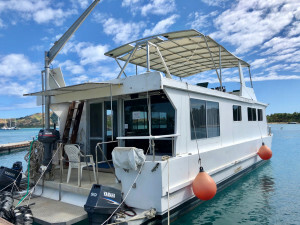 The vessel is a Jabaru design catamaran constructed in kitset form by Jabaru in Australia, one of several dozen vessels produced by them in fibreglass from female moulds. 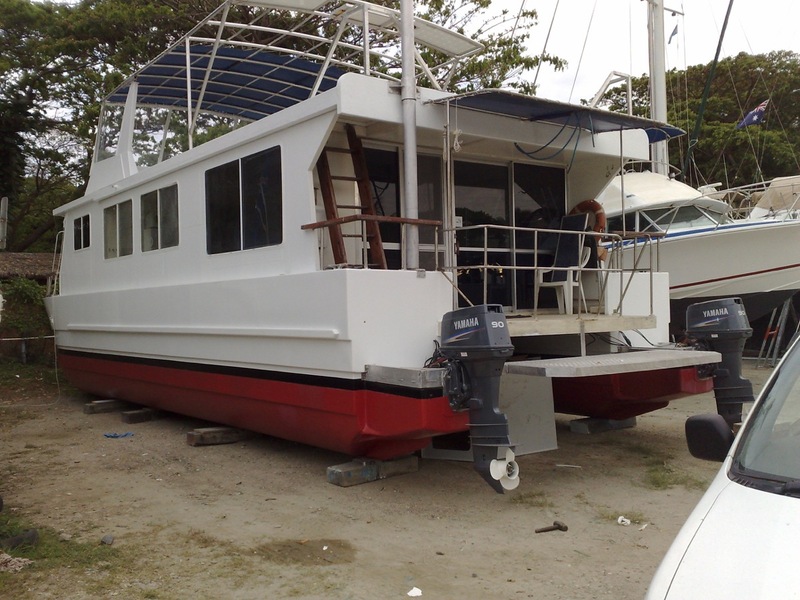 The hulls, decks and structural components were then shipped to Fiji for final assembly first launching being approx 1990. 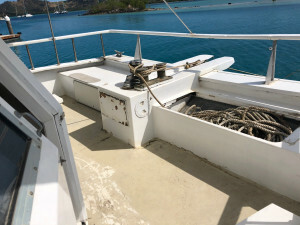 The hulls are solid fibreglass and were taken back to the bare glass and given 3 coats of epoxy coating before launching after a major refit in July 2010. 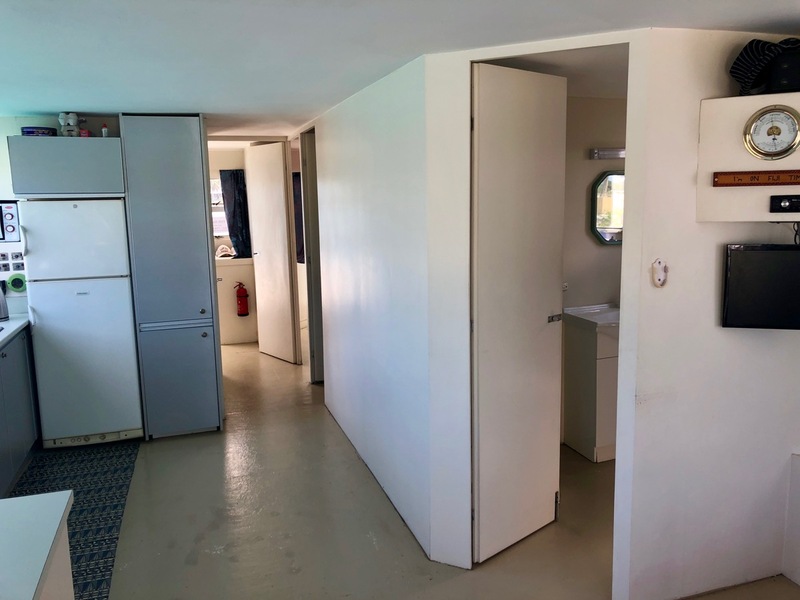 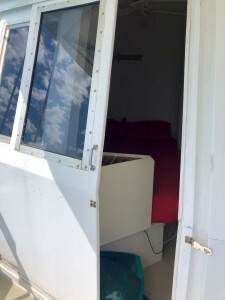 The entire inside of the boat was refitted to give a 3 double stateroom layout with separate bathroom and combined kitchen-dining-lounge layout on the main deck with a full length fly-bridge above with full canopy cover and clear screen protection of the helm position and controls. The boat can be lifted out by Travel Lift and placed on to the hard at Vuda Marina for maintenance and anti fouling. The most recent lift out was in May 2017 and 3 coats of anti foul applied, motor servicing and other general maintenance. This 51' houseboat offers huge amount of usable space. 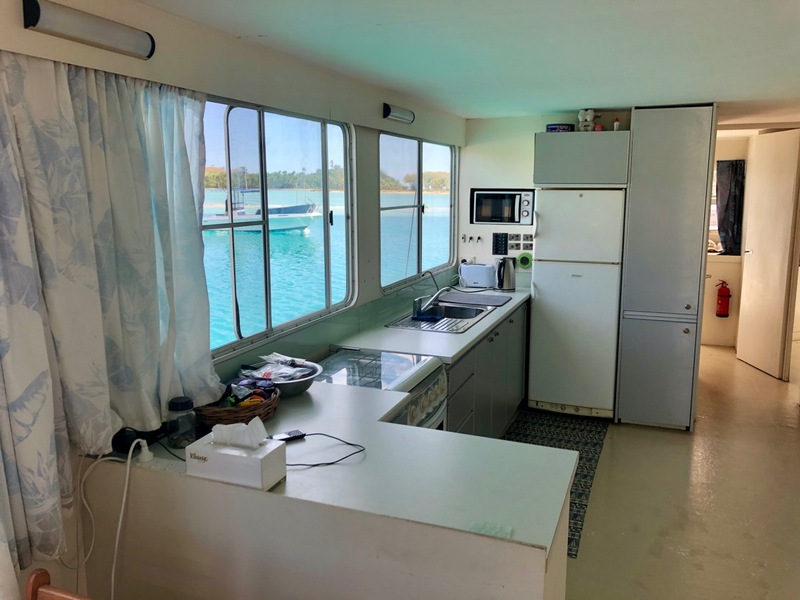 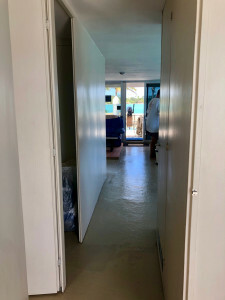 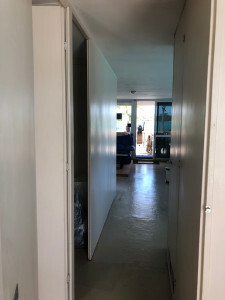 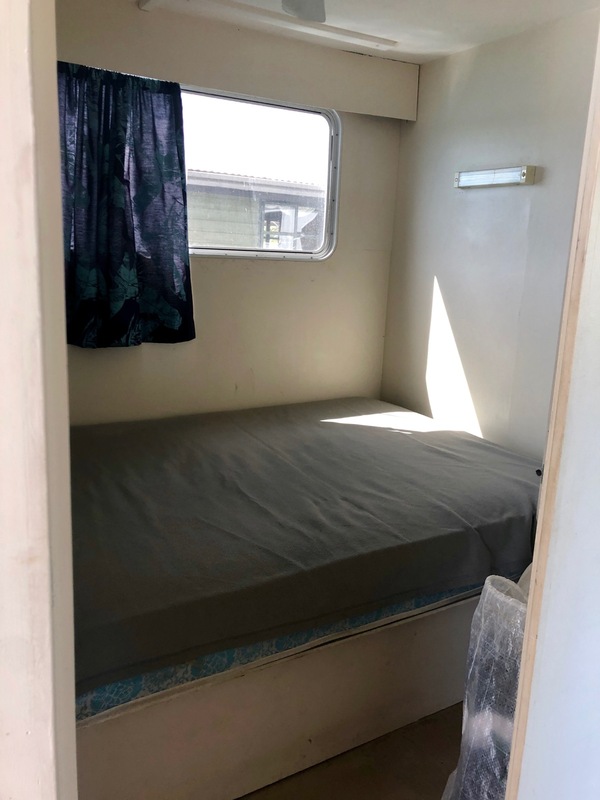 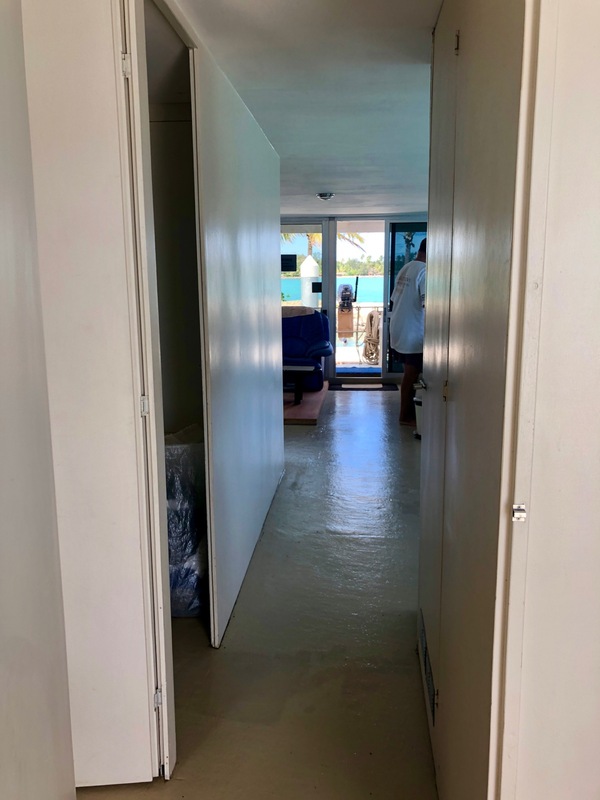 The interior is intelligently designed around a large L shape lounge and dining area, and kitchen that will rival what you would find in a decent size apartment. 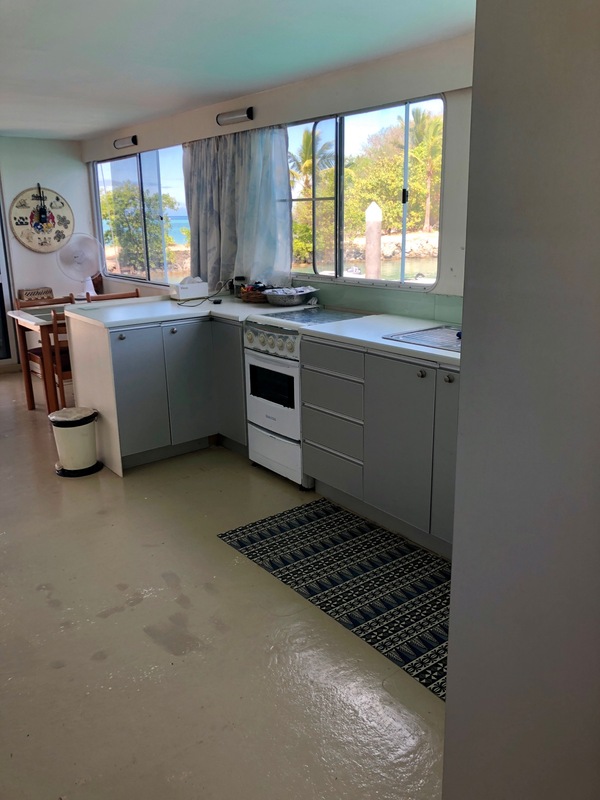 The kitchen is designed as an open-plan L shape equipped with factory manufactured kitchen cupboards and a bench top in good condition. 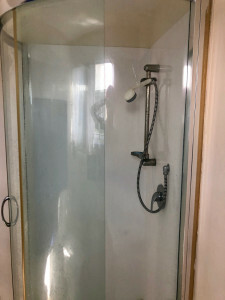 Everything is very clean. 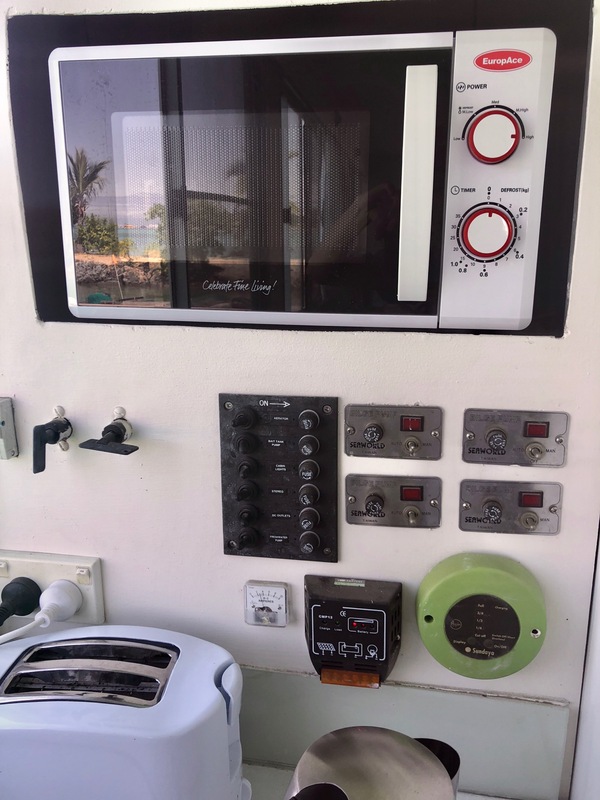 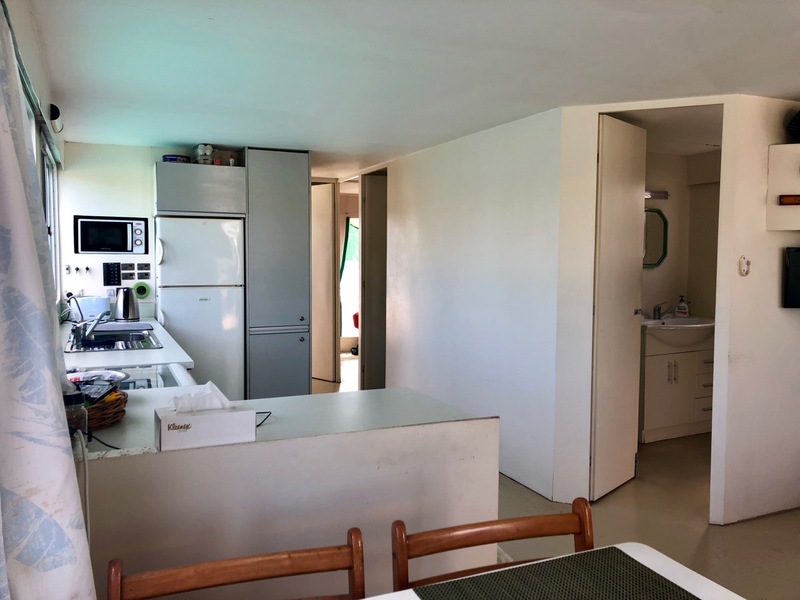 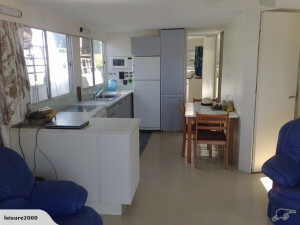 The kitchen is equipped with a 400l litres free-standing gas/ electric fridge freezer (can be used either with gas or electricity depending on whether you are on mooring or at a marina connected to shore power), 4 burner gas stove with full oven, bench and sink with single lever faucet, and a microwave oven (new 2017). 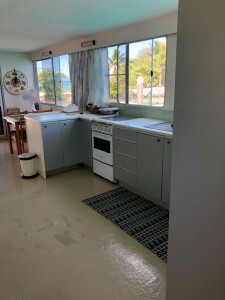 Also included are cutlery and crockery and an assortment of cooking utensils. 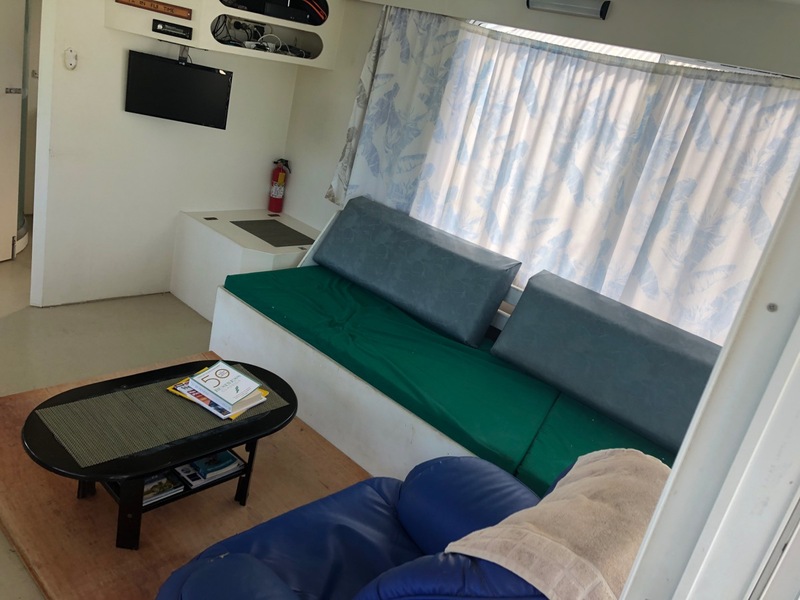 Furnitures include a lounge chair and wooden settee with large storage capability (capable of easy conversion to a single bed), dining table and 4 chairs. The master and first guest bedrooms open onto the forward cockpit. 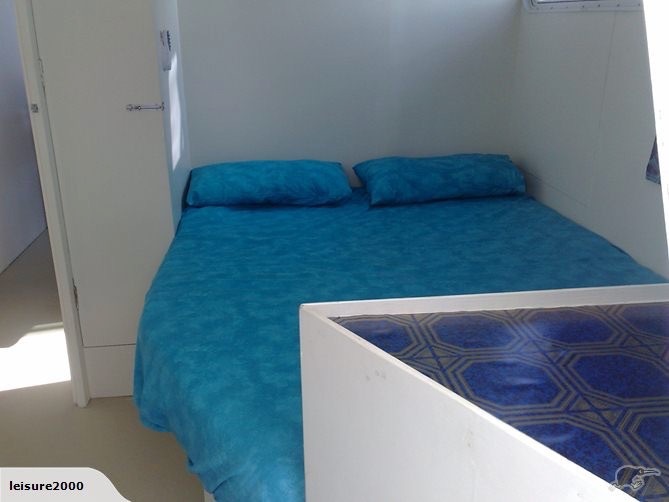 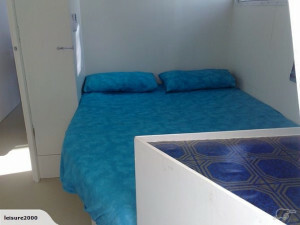 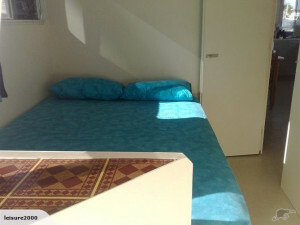 All three bedrooms are fitted with large 12V overhead fans which will keep you cool even on hot days. The bathroom is fitted to include a glass door half round hot and cold shower of good proportions, ceramic top vanity and full flush toilet. 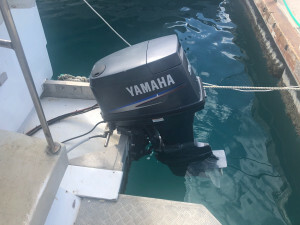 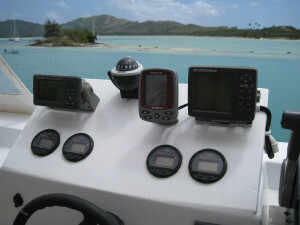 Dual single lever control system for outboard motors with twin ram hydraulic steering. The vessel cruises comfortably at 3500 revs giving 14km per hr and a range of approx. 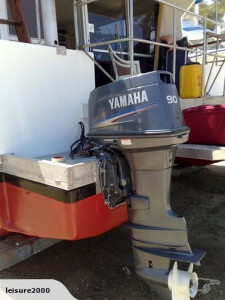 350 km and can achieve 20km per hr max. -Dive equipment: 3 scuba tanks, flippers, masks, snorkels, catch bag. 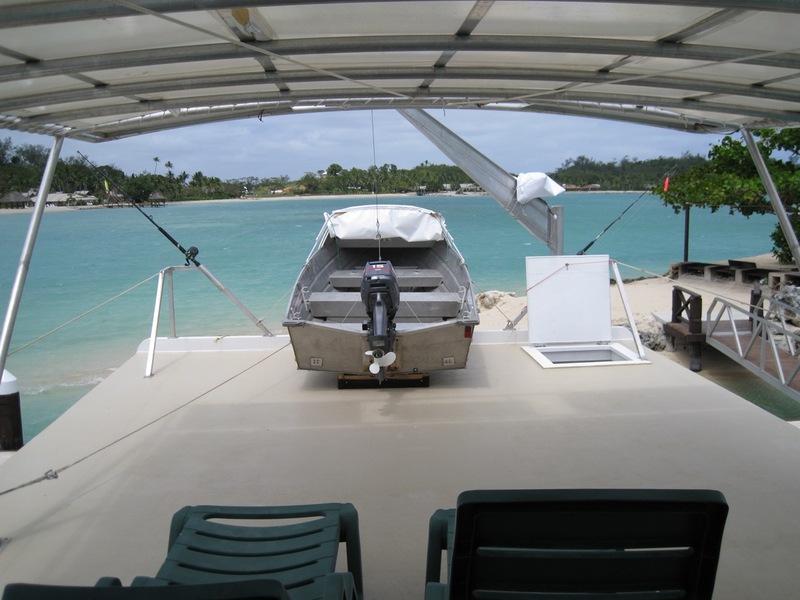 -Fyran 12ft Aluminium dingy and canopy with 15hp Yamaha outboard motor , oars, anchor and chain, Electric davit for dingy lifting to upper deck. 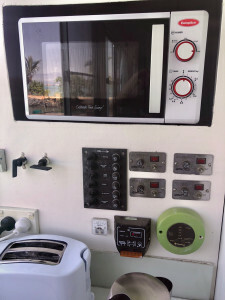 -Stainless steel Kiwi Sizzlar Barbeque with separate gas bottle. 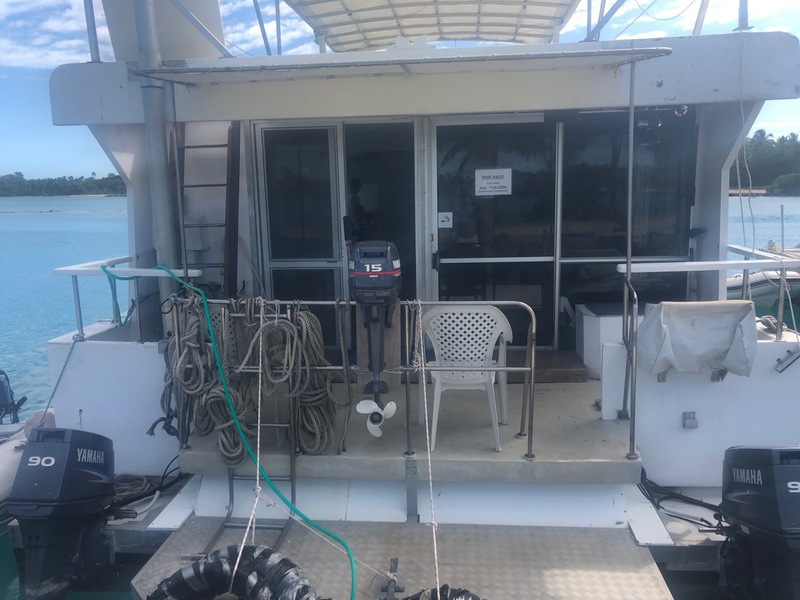 -Tools include: 20amp 240/ 12 volt battery charger, Electric skill saw, electric planer, electric drill, electric angle grinder, 2 sets of drill bits msc. 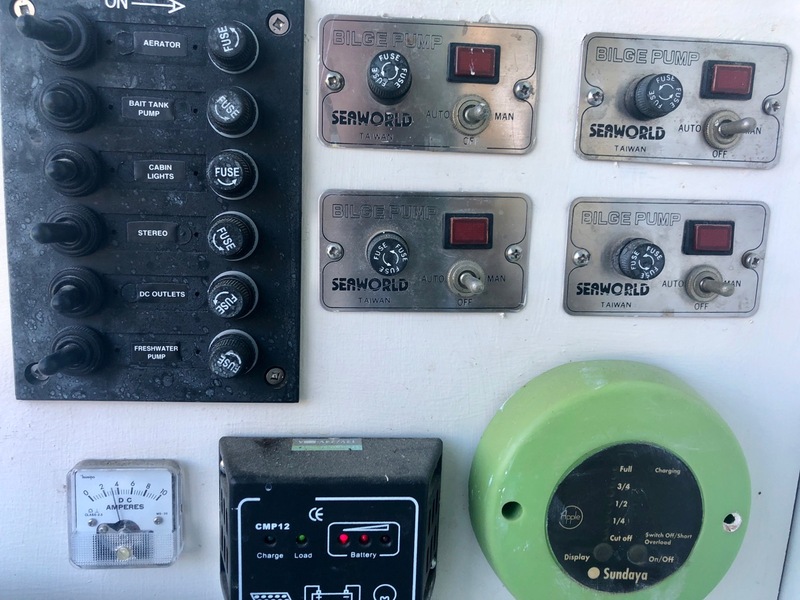 Woodworking hand tools and mechanical. Service tools including 1⁄4 and 3/8 drive socket sets. 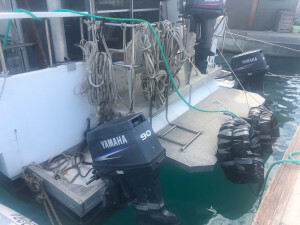 2 x 20kg CQR type anchors, 2 x 100 metre warps with ground chain, Maxwell 220016 heavy duty electric anchor winch with remote switching. Electrical fittings include pressure water pump to bathroom and kitchen, separate seawater pump to toilet, macerating pump out system to 1000litre holding tank, 4 x 4500 lt per hr bilge pumps with auto switching, 200watt solar charging system in 2 banks, 5 x 12v 80amp hr batteries, 2400 watt inverter (not installed), 12 / 240 volt computer, Epson Printer , stereo /CD player with USB input, 22 inch flat screen TV/monitor, VHF radio, 2 x depth finders and GPS navigation system. 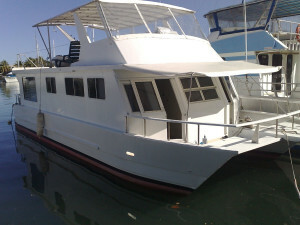 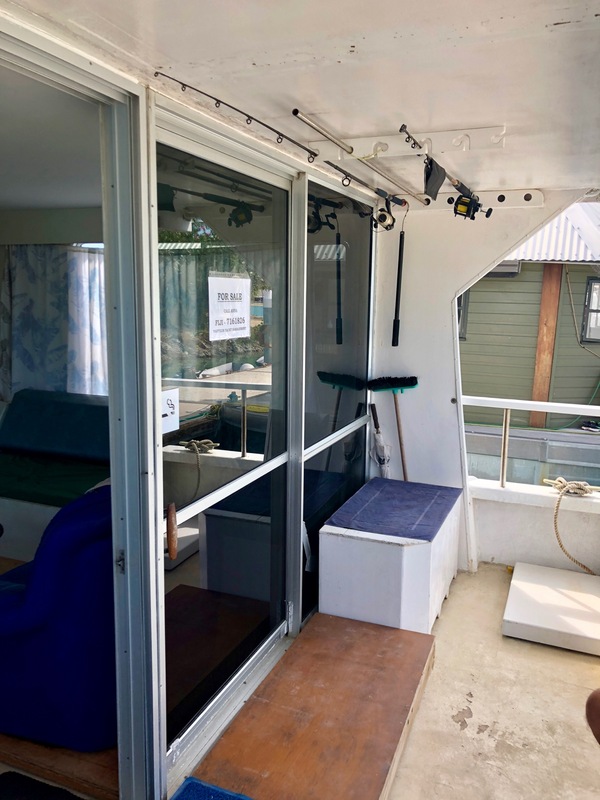 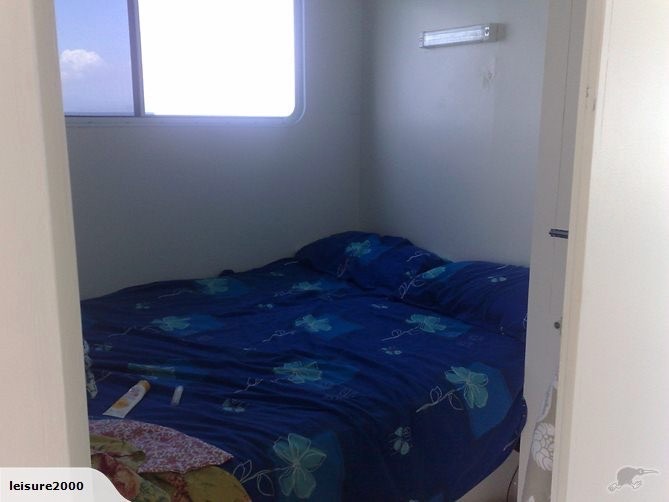 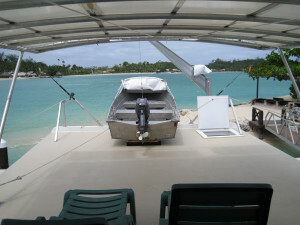 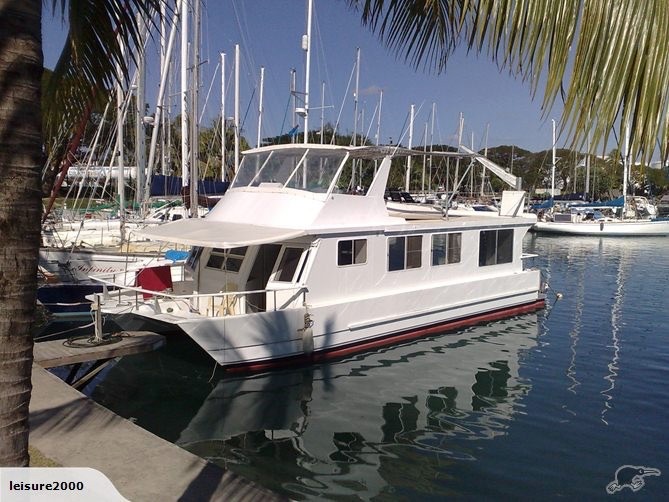 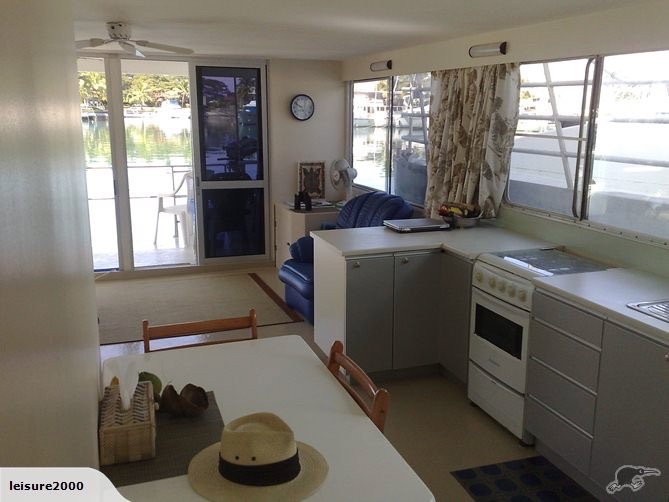 I would like to enquire about #HBJ5118 51' Jabiru Power Catamaran (Houseboat) For Sale in Fiji.